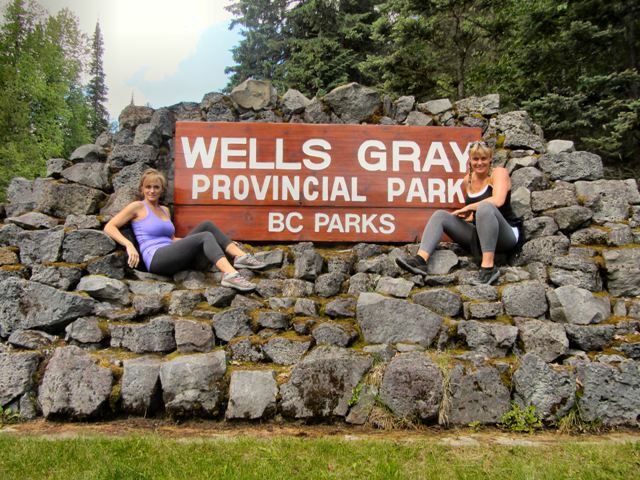 Nicknamed "Canada's Waterfalls Park", Wells Gray Provincial Park has 39 waterfalls within its boundaries and many more if you count the numerous creeks that cascade down the mountainsides. It was named after Minister of Lands, Arthur Wellesley Gray who recognized the growing need to preserve special places in British Columbia. In 1939, a forest ranger near Clearwater, Bill Noble, recommended the area be turned into a park and on November 28, 1939, Gray passed an Order-in-Council creating a huge park around most of the drainage basin of the Clearwater River. He named the park for himself (Wells was his nickname). After a quick stop at the tourist center to pick up a free map, make your way to Spahats Creek Falls, a 197 ft tall waterfall on Spahats Creek that drops into the Granite Canyon of the Clearwater River. Spahats is the First Nations term for bear and the creek was called Bear Creek in the 50’s but due to the large number of Bear Creeks in BC, the name Spahats was adopted in the late 60’s. From there drive a little further up the road until you reach the trail head for Moul Falls. A one hour hike will take you to the third highest waterfall in the park and the only one that people can stand behind. Named after Charlie Moul one of the areas earliest settlers (he left Clearwater Valley in 1914 to serve in World War I and never returned), people can walk behind the falls to view them from the inside of a large cave. Although the experience will leave you soaked, it is well worth it. Hopefully it will be a warm day so you can dry off by the time you reach your car. The next major stop is Dawson Falls where a 10-minute walk will get you to the main viewpoint, and then another couple minutes will get you to the top of the waterfall. At Dawson Falls the Murtle River drops over lava flows dating back about 20,000 years. Then stop for a picnic lunch at Helmcken Falls. This 463 foot waterfall on the Murtle River is the fourth tallest in Canada and one of the reasons for the creation of Wells Gray Park. This name honored John Sebastian Helmcken, a physician with the Hudson's Bay Company who arrived in Victoria in 1850. He helped bring British Columbia into Canadian Confederation in 1871. Dr. Helmcken died in 1920 at the age of 95, but never actually saw the falls himself. If you are visiting in the fall, the highlight your day will no doubt be the next stop: Bailey’s Chute, where countless Chinook salmon try to jump the falls on their way to their spawning grounds. The road ends at Clearwater Lake – one of six large lakes in the park. It got its name from the Overlanders rafting expedition to the Cariboo goldfields in 1862. When they arrived at the mouth of the Clearwater River, they noted its distinct clarity compared to the muddy North Thompson and named it Clear Water. The river's name was later extended to the lake. If you are there in the summer be sure to take a bout tour of the Clearwater and Azure Lakes - glacial fed lakes that remain cold year round. The tour will bring you into the wilderness to enjoy the beauty of the Caribou Mountains and then take you on an interpretive walk through a five hundred year old rainforest to the base of Rainbow Falls. Drive to Clearwater, BC approximately 1.5 hours from Kamloops.